Help your kids to love creative writing! To make writing more exciting for first and second grade students, you need to give them a chance to grow their creativity and imagination. The Writing Prompts Workbook is a collection of imaginative situations and questions that will get your students and children using their brains to come up with wildly creative ideas when they begin to put pen to paper. 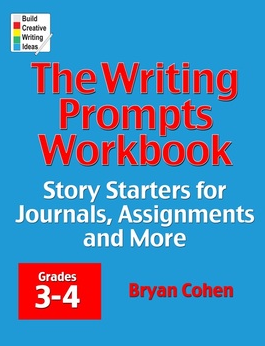 Bryan Cohen, the author of 1,000 Creative Writing Prompts and 500 Writing Prompts for Kids, has compiled 200 of some of his best prompts for third and fourth graders in this workbook. Use them for journals, assignments, poems, conversations, songs and more. Get the Writing Prompts Workbook today and watch your child's creativity flow! 28. Describe how each of the following real world professions might have to use math in their everyday jobs: scientist, firefighter, policeman, teacher and engineer. 43. The television networks have come knocking on your door asking you to write the next great comedy or drama. What do you make your show about and who are some of the actors you would cast in it? 104. What do you think your parents were like when they were your age? Do you think they were the same as you or different from you? Would you and your parents have been friends? Get 100 writing worksheets today for just $3.99! What are parents and teachers saying about my workbooks? "I am totally excited about these books and what they have done for my children!" T. Filleman, 5-star Amazon review. "Overall, I think this is a valuable resource for any teacher looking to spice up writing time!" Stephanie Young, 4-star Amazon review. "I'm looking forward to more books from Bryan Cohen," Jan Messali, 5-star Amazon review. Today is the day to help your kids to love writing! Buy the book today! Want to get The Writing Prompts Workbook in paperback? Click here to have it shipped to your door by Amazon!